Mata Amritanandamayi Math launches 60th birthday celebrations of Sri Mata Amritanandamayi with several social activities! Hyderabad, September 1st, 2013: MATA AMRITANANDAMAYI MATH – known for its extensivecharitable activities across the world;isorganising a month long 60th Birthday celebrations of Sathguru Sri Mata Amritanandamayi Devi– an embodiment oflove, compassion and selflessness; from September 1st, 2013, all over the world, including Hyderabad. The Hyderabad Chapter of the Mata Amritanandamayi Math launched the celebrationsby organising a Free Medical Camp, Blood Donation Camp and Annadanam, on Sunday,at its premises at 844/1, Mahendra Hills, East Marredpally, Secunderabad. The Free Medical campwas inaugurated by Hon’ble Union Minister for Roads& Highways, Sri Sarvey Sathyanarayanaand the Blood Donation camp was inaugurated by MP from Rajya Sabha, Sri Anand Bhasker, on Sunday at the Mata Amritanandamayi Math, Mahendra Hills. The camp attended in large numbers by people from near and far, had specialists from Cardiology, Orthopaedics, General Medicine, Gynaecology and Paediatrics providing free consultation, screening and free medication. 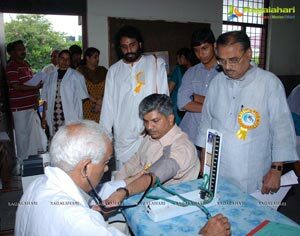 Devotees and public voluntarily came forward to donate blood at the Blood donation camp organised by the math. As part of the month long celebrations, the Mata Amritanandamayi Math, (MAM)Hyderabad is hosting a slew of activitiesincluding annadanam, tree planting, training in tailoring, medical camps, blood donation camps, etc., in Hyderabad and Andhra Pradesh. GREENERY CAMPAIGN-A massive greenery campaign is being taken up by devotees in Karimnagar and Medak by pledging to plant 60000 saplings in each of these districts during the next six months,starting from September 1st2013. NUTRITIOUS MID-DAY MEALS - “YUWA” is Youth Wing of Amrita involved in voluntary services. It is continuous endeavor of the Math to bring out the best of YUWA members by way of involving them in various social welfare projects. In Chegunta, Medak District it was identified that the mid-day meals served is quite bland with just rice and diluted dal. Hence math has decided to initiate vegetable gardening project through YUWA and the produce of the vegetable garden will be donated to mid-day meal scheme. MAM Karimnagar Districtwill launch a drive to plant 1000 saplings,the local MLA fromTRS Sri E.Rajender will inaugurate the drive. MAM Mahboobnagar Districtis organising afree medical camp in one of the most remote and backward village.Local MLA and the Minister for Information and Public Relations, Government of Andhra Pradesh,Smt. D.K. Aruna, will inaugurate the camp. MAM Khammam Districtis organising a Blood donation camp and will be inaugurated by the local MLA from TDP, Mr. Sandra Venkata Veerayya. 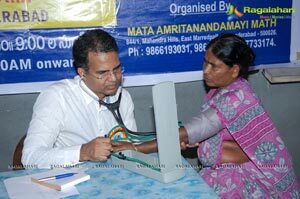 MAM VishakapatnamDistrict will organise free medical camp and annadanam in a most backward village. The activity will be inaugurated by Minister for Ports and Infrastructure, Ganta Srinivasa Rao along with the Local MLA from Congress Dronam Raju Srinivas. MAM Tirupatiis hostingan annadanam for 2000 poor people and the local MLA from YSRCP Sri Karunakar Reddy will inaugurate it. Amma was born in a remote coastal village in kerala, Southern India. Even as a child, Amma expressed love and compassion to everyone. Amma says, "An unbroken stream of love flows from Amma to all beings in the Universe. This is Amma's inborn nature." Right from childhood, Amma wondered why people in the world have to suffer. Whenever she had time, Amma used to lead poor people to her parents' house. There, she would give them a hot bath and feed them. Occasionally she even stole things from her own house to give to these starving families. Even from early childhood Amma knew that God - the Self, the Supreme Power - alone is Truth and that the world is not the absolute reality. Therefore, she would spend long period immersed in deep meditation. Amma's parents and relatives didn't understand what was happening. Out of ignorance, they began scolding her, opposing her spiritual practices. But Amma was immersed in her own world, totally unaffected by the criticism and chastising of her family. During this time, Amma had to spend her days and nights outside, under the open sky, forgoing food and sleep. Experiencing her oneness with all of creation, Amma realized that her purpose in life was to uplift the ailing humanity. It was then that Amma started the spiritual mission, spreading the message of Truth, love and compassion throughoutthe world by receiving one and all. Today, through her extraordinary acts of love and self-sacrifice, Mata Amritanandamayi Devi, Amma, has endeared herself to millions of people around the world. Tenderly caressing everyone who comes to her, holding them close to her heart in a loving embrace, Amma shares her boundless love with all - regardless of their beliefs, who they are or why they have come to her. In this simple yet powerful way, Amma is transforming the lives of countless people, helping their hearts to blossom, one embrace at a time. Her tireless spirit of dedication to uplifting others has inspired a vast network of charitable activities through which people are discovering the sense of peace that comes from selflessly serving others. Amma’s teachings are universal. Whenever she is asked about her religion, she replies that her religion is Love. She does not ask anyone to believe in God or to change their faith, but only to inquire into their own real nature, and to believe in themselves. Amma says, "Love is the only medicine that can heal the wounds of the world. In this universe, it is love that binds everything together. As this awareness dawns within us, all disharmony will cease. Abiding peace alone will reign." -- Let us follow Amma's advices and bring light in our lives.